Earlier in the Engines section we saw how 4 stroke & 2 stroke engines work ! We might like to give a thought on which is better one OR which has more advantages. 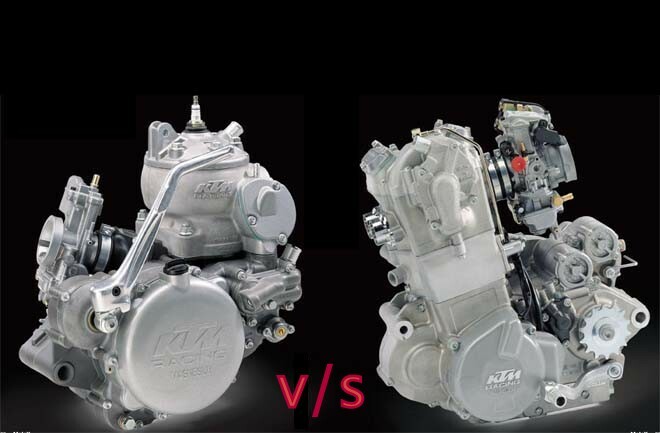 So in this article we are going to discuss about the differences, advantages & disadvantages of 4 stroke & 2 stroke engine. Working of 2 stroke engine ! Working of 4 stroke engine ! 4 stroke engine completes 2 rotations of crankshaft after completing one cycle. 2 stroke engine completes 1 rotation of crankshaft after completing one cycle. Power is produced once every 4 strokes of the piston. Power is produced once during 2 strokes of the piston. Engine design is a bit complicated due to valve mechanism which is operated through gear & chain mechanism. 2 stroke engine has ports which makes it's design simpler. No need of adding oil or lubricant to fuel. Addition of oil is required. Top side of the piston is flat. A bump or protuberance may be needed on top side of piston. Mixture remains only in the combustion chamber. Air-fuel mixture enters through inlet port & travels to combustion chamber passing through crankcase. 4 stroke engines are heavier. 2 stroke engines are lighter comparatively. 4 stroke engines make less noise. 2 stroke engines are louder comparatively. Note :- For detailed explanations & working visit here for 4 stroke engine & 2 stroke engine ! More torque :- In general, 4 stroke engines always make extra torque than 2 stroke engine at low RPM. Although 2 stroked ones give higher torque at higher RPM but it has a lot to do with fuel efficiency. More fuel efficiency :- 4 stroke engines have greater fuel efficiency than 2 stroke ones because fuel is consumed once every 4 strokes. Less pollution :- As power is generated once every 4 strokes & also as no oil or lubricant is added to the fuel; 4 stroke engine produces less pollution. More durability :- We all know that more the engine runs, quicker it wears out. 2 stroke engines are designed for high RPM. If an engine can go for 10000 rpm’s before it wears out; a 4 stroke engine with 100 rpm will run for 100 minutes than the other 2 stroke engine which has a higher rpm of 500 & will run for only 20 minutes. No extra addition of oil :- Only the moving parts need lubrication intermediately. No extra oil or lubricant is added to fuel. Complicated design :- A 4 stroke engine has complex valve mechanisms operated & controlled by gears & chain. Also there are many parts to worry about which makes it harder to troubleshoot. Less powerful :- As power gets delivered once every 2 rotations of crankshaft(4 strokes), hence 4 stroke is less powerful. Expensive :- A four stroke engine has much more parts than 2 stroke engine. So they often require repairs which leads to greater expense. You might like – How do Wankel engines work ? Simple design & construction :- It doesn’t have valves. It simply has inlet & outlet ports which makes it simpler. More powerful :- In 2 stroke engine, every alternate stroke is power stroke unlike 4 stroked one in which power gets delivered once every 4 strokes. This gives a significant power boost. Also, the acceleration will be higher & power delivery will be uniform due to same reason. Position doesn’t matter :- 2 stroke engine can work in any position as lubrication is done through the means of fuel (as the fuel passes by through whole cylinder & crankcase). Less fuel efficiency :- For every alternate power stroke, fuel gets consumed every alternate stroke. This makes the engine less fuel efficient although it results in uniform power delivery. Oil addition could be expensive :- Two-stroke engines require a mix of oil in with the air-fuel mixture to lubricate the crankshaft, connecting rod and cylinder walls. These oils may empty your pockets. More pollution :- 2 stroke engine produces a lot of pollution. The combustion of oil added in the mixture creates a lot of smoke which leads to air pollution. Wastage of fuel :- Sometimes the fresh charge which is going to undergo combustion gets out along with the exhaust gases. This leads to wastage of fuel & also power delivery of the engine gets effected. Improper combustion :- The exhaust gases often get trapped inside the combustion chamber. This makes the fresh charge impure. Therefore maximum power doesn’t get delivered because of improper incomplete combustion. Visit our Engines section to know more about automobile & aircraft engines 🙂 ! Thanks for that, it was very informative. It would seem that both types of engine have inherent advantages and disadvantages when compared which one should take into consideration when selecting which engine is more suitable for a given task. Very comprehensive and informative write up. request more on other areas of marine engineering. this is exactly what am looking for … well explanation simple and easy to comprehend ..
Lubrication of the two stroke,what type of lubrication is used? Lubrication is done by adding oil & other engine-friendly lubricants in the fuel itself. The parts get lubricated when the fuel in gaseous form passes through crankcase ! Thank you for your valuable information keep it up ??? Good stuff! Thank you so much. Wouldn’t mind some maintenance tips on both types though! Vey well explained. You got in all the facts and you made it very simple to understand. Thansk you. Wonderful information. I have had extensive information on differences between 2 and 4 stroke engines. Thank you!